For the longest time I wanted a FitBit One but I'd read reviews of people losing the tracker because it'd popped out of the holder, without them noticing. Two years ago FitBit released the Flex and I was unsure as to whether it was as accurate as the One. Being that it's on your wrist, is it a true representation of how many steps you've taken? Since then FitBit have come out with 4 more wristband trackers. There's also the Nike+ FuelBand, Jawbone Up, Garmin Vivosmart, there is a ton of different ones to choose from. All with different uses so it's best to have a look at what you feel will fit in best with your lifestyle. With all these brands releasing wrist trackers it seems that they are seemingly accurate and really rather popular. Just lately everyone seems to be jumping on the FitBit hype and it wasn't long before quite a few people I know had them. So I decided I was going to bite the bullet and ordered one. I opted for the pink as it's one I'd seen in person and really loved the brightness of the colour. When first buying a Flex you'll receive 2 wristbands. A small which is suitable for wrists 5.5" to 6.9" and a large which is suitable for wrists 6.3" 8.2". So whether you have tiny or large wrists, it's probably going to fit you. I prefer to wear the large band, with 2 holes free as I find this to be the most comfortable. You slip the tracker into the back of the wristband and you're good to go. FitBit say the battery life is around 5 days but I've found I've got more than a week out of a charge. It just depends on how much you're syncing it or setting alarms. It's easy to charge, just pop it out of the wristband and into the charging dongle that you plug into a USB port and when all lights are flashing it's fully charged. It usually takes a couple of hours. The Flex tracker has 5 LED lights on it's display. 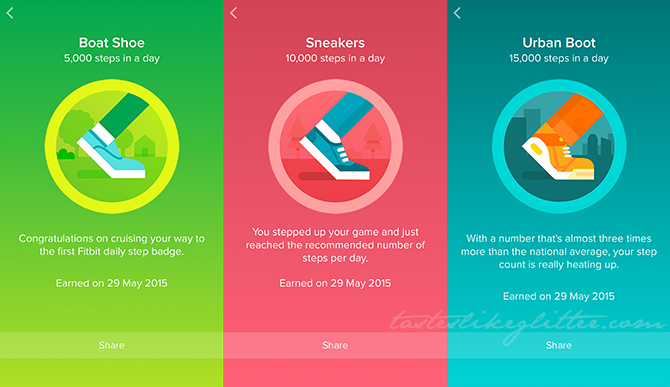 Each one represents an increment of 2,000 steps. 10,000 steps is the daily recommended amount so once you hit all 5 lights you'll be notified with a vibrating wristband. To this day it never fails to make me jump because it usually happens when I list it expect it. If you're curious of your progress you can tap the wristband twice and it will light up and flash on the 'level' that you are currently on. 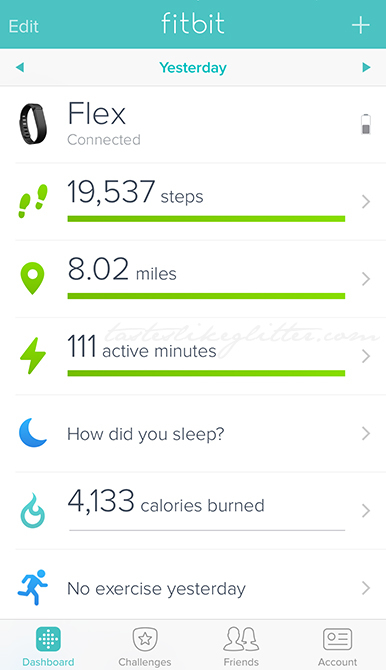 On the first day of using my FitBit I kept my iPhone in my pocket throughout my shift at work. Both the FitBit app and the steps app on the iPhone health section registered almost the same amount of steps. The FitBit Flex can also be used as a sleep tracker. Just simply tap a few times on the band and you'll be in sleep mode. You'll see 2 lights flashing back and forth to alert you of this. In the morning just rapidly tap again to make sure you're out of sleep mode before you start your day. You can check how restless you were, how many times you woke and how much sleep you actually had using the app. It's also completely waterproof so you can use it to track water activities. I wore it in the shower once and decided not to again. Condensation can cloud up or collect in the little window which I find annoying. Nothing a cotton bud won't clean out but I'd just prefer it not to be there to start with. The FitBit dashboard has a number of options on the home screen that you can rearrange and delete, depending on what you're more interested in. Not picture is also the option to see how much you weigh, calories eaten, a food plan (if you choose to have one) and how much you've drank. This will help you to find out exact number of steps or how restless you were through the night. The tracker syncs wirelessly via bluetooth. I always keep my bluetooth switched off on my iPhone, as to save battery life. So I manually sync it as and when I need to. Usually at the end of the day or when I'm curious as to how long before I 'level up' to the next light. If you have the FitBit Aria scales they also sync up with the app so you don't have to manually record your weight changes. One of my favourite things about the Flex is the silent alarms. I must admit I was apprehensive to use them at first as I feared sleeping through it. So just to be on the safe side I set my usual alarm on my iPhone for 10 minutes later. The way the silent alarm works is by setting it on the app for the time which you require and it will gently wake you up with no sound, just vibrations. It's the strangest thing. I get irrationally angry when I hear my phone start jingling away so it's a really great option. Though I still like to set my phone alarm just incase. It's also useful to use throughout the day if you need to remember things such as to take medication at a certain time. 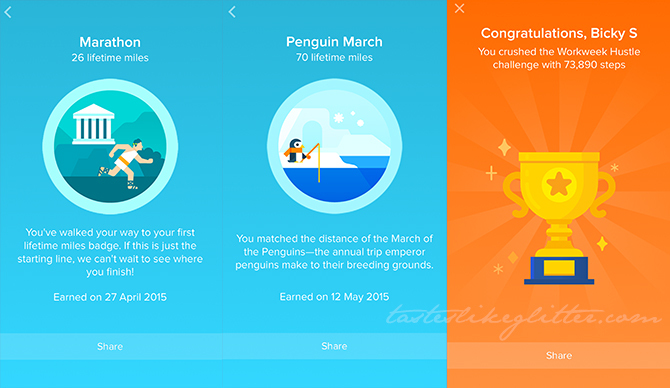 One of the great things about FitBit is the social side of things. Regardless of which model you have, you can add friends on the app and use it to cheer or taunt them. I personally only ever use the cheer. No one wants to be taunted for having a lazy day, right? You can send messages to a group or to an individual. And one of the best things is the challenges. Each challenge allows up to 10 participants to join. Showing each others progress throughout the entire challenge. Once the challenge is finished you have 12 hours to sync your steps before the winner is crowned and given a little cup (as above). One of the other great things (also above) are the badges you're periodically rewarded. These are stored on your profile for yourself and others to see. I think it's a really nice touch to know just how far you've walked. All in all I love my Flex and I don't regret buying it one bit. Since I'm nearly always on my feet at work it's interesting to find out how many steps I take in a day. Although it drastically drops on my days off but hey! That's what days off are for. I think since getting my Flex it's made me challenge myself a little more. I find myself pacing at work, rather than just standing still - just to get my steps up. If it's not raining I will get off the bus a mile before my house, purely because it's easier to walk than from the station as it's all flat. And of course it's also just to get those extra steps in. I've become competitive with those in my friends list to beat their daily goals. I want to be top of the leaderboard! If you're looking to get more active or already are and you're curious about your daily activities, I can't recommend a FitBit highly enough. The pricier versions can measure other things such as heart rate so it's worth looking into which model would be best for you. Once you start using it I can guarantee you'll easily become addicted!